PACIFIC OCEAN - USS Peleliu (LHA 5) is scheduled to return Dec. 24 to Naval Base San Diego from a six-month deployment to the Western Pacific. 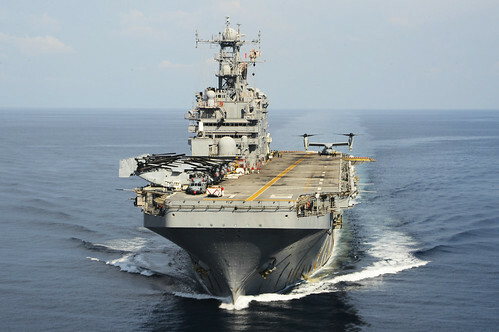 Upon return, the ship will make preparations to decommission in March after 34 years of service, 17 deployments and more than a million miles transited, and as the last remaining Tarawa-class amphibious assault ship. During the ship's deployment Peleliu, its crew, Commander, Amphibious Squadron Three, Special Purpose Marine Task Force Three and Helicopter Sea Combat Squadron (HSC) 21 participated in Rim of the Pacific (RIMPAC) 2014 as part of U.S. 3rd Fleet. Upon assignment to 7th Fleet, the ship embarked Commander, Amphibious Force Seventh Fleet, Commander, Amphibious Squadron 11 and 31st Marine Expeditionary Unit and joined USS Germantown (LSD 42) to form the Peleliu Amphibious Readiness Group (ARG). While deployed, the ARG conducted security and stability operations and exercises throughout the Indo-Asia-Pacific region to include Amphibious Landing Exercise (PHIBLEX) 15 and other maritime cooperation exercises with partner nations. "Peleliu and her crew performed superbly throughout the deployment, serving as our flagship for the Amphibious Readiness Group," said Commodore Heidi Agle, commander, Amphibious Squadron Eleven. "I am proud to have served with such outstanding Sailors and Marines during the ship's final deployment." U.S. Pacific Fleet announced in February that USS Green Bay (LPD 20) will be forward deployed to replace the decommissioned USS Denver (LPD 9) in Japan. Peleliu deployed to the Western Pacific to mitigate the gap in amphibious presence. The ship visited numerous ports including, Apra Harbor, Guam; Sasebo and Okinawa, Japan; Subic Bay, Philippines, and Singapore. During the visits, Peleliu competed against partner nation teams during various sporting events and participated in community relations projects. "Through community relations activities, Peleliu extended efforts to support strong relationships with both U.S.-based partners as well as regional allies and friends throughout the Western Pacific," said Cmdr. Jack Carver, the ship's chaplain. "They also offered our Sailors and Marines the opportunity to learn and develop an appreciation for the rich cultural heritage." Over the course of deployment, Peleliu transited more than 25,000 nautical miles, conducted the safe launch and recovery of more than 50 Landing Craft Utility, 30 Landing Craft Air Cushion, and 25 Amphibious Assault Vehicle ship to shore movements, as well as carrier and deck landing qualifications and operations for U.S. Navy and Marine Corps aircraft squadrons, U.S. Army 160th Airborne and foreign aircraft from Colombia, Peru, Mexico and Argentina. Peleliu is named for the Battle of Peleliu during World War II where 1,256 Marines gave their lives to take Peleliu. "The crew routinely stepped up and exceeded my expectations during this challenging final deployment and I know that would not have been possible without the enormous support of our families and friends back at home" said Capt. Paul Spedero, commanding officer of Peleliu. "I'm proud of this crew and their dedicated families."